We demand an immediate reversal of Fixed charges hiked by DERC ! Inspite of very serious & shocking issues in the ARR petitions of DISCOMs, they are going to announce the Power Tariff today at around 3pm. Shockingly, we the stakeholders were not at all informed/intimated about the Public hearing. 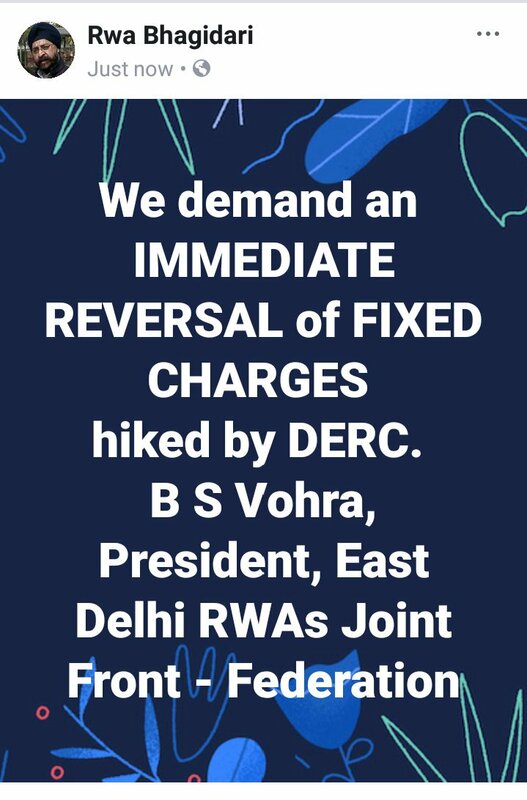 We strongly oppose any such move of DERC. Let DERC announce the New Tariff, we will share the Shocking issues with the Media. Do they have the right to collect the Conversion as well as the one time parking charges? As per the Bare Act of DDA, ”Escrow Account" means a dedicated savings account held by the Local Body concerned not being operative unless the conditions for which it has been opened are fulfilled in accordance with the provisions of these regulations”. In such a case how Civic bodies either diverted the Amount collected under this Account for other establishment expenditure including salaries or failed to use most of the amount, is a very serious cause of concern for one & the all. However, the data submitted shows that the Municipal Corporation of Delhi collected Rs. 1,128.72 crore from 2006-2007 till 2011-2012, but only about 8% or Rs. 101.39 crore was spent through the escrow account on developing the areas or creating parking. The majority of the fund or Rs. 1,027.33 crore was spent on “other establishment expenditure”, which includes salaries. After the MCD was split into three in 2012, the North Delhi Municipal Corporation collected Rs. 643.41 crore from 2012-2013 to 2016-2017. Only Rs. 28.19 crore was spent on escrow expenditure, while the remaining Rs. 615.22 crore was spent on other establishment expenses. While the North Corporation diverted the majority of the funds, the South Delhi Municipal Corporation (SDMC) failed to use most of the parking and conversion charges it collected. From 2012-2013 till 2016-2017, the SDMC collected a total of Rs. 1,125.05 crore, but the expenditure from the escrow was Rs. 146.87 crore. Currently, Rs. 925 crore is available in the account, SDMC data shows. The East Delhi Municipal Corporation (EDMC) collected Rs. 166.02 crore in conversion charges and Rs. 49.95 crore in parking charges from 2012-2013 till 2017-2018 (till now). The EDMC data showed that the civic body spent Rs. 8.38 crore of the parking charges on developing parking, while Rs. 18.16 crore was spent on salaries and Rs. 23.40 crore remained unused. We are trying to find out the status of the rest of the Rs 166.03 crore. In such circumstances, do you think that our Civic bodies have any right to collect the Conversion as well as the one-time parking charges? It was said earlier that no development charges for parking shall be payable by small shop owners of the area up to 20 sqm. dealing with the items/activities as defined in para 15.6.3 of the MPD-2021 in respect of any category of colonies. But now, development charges for parking are being demanded even from the small shop owners. Is there any such change in the Act? It was also said earlier that Development charges for parking shall also not be payable by owner/ allottee/resident/user of the plot/dwelling units falling under notified pedestrian shopping streets both mixed-use or commercial pedestrian streets. Please check the Links depicting Pedestrian Streets of Delhi that were Notified in the Delhi Gazette on 15th September 2006. You can easily find out if you are on a Pedestrian street & if you are being charged for all such development charges? The issues mentioned in the Proposed modifications of DDA as well the Affidavit submitted with the SC say the same story. Even the Draft parking policy is there in it even before any discussion on various clauses. They just want your money by way of various Taxes, be it the GST, Road Tax, Toll Tax, House Tax, Conversion charges, One-time parking charges as well the proposed parking charges in the draft policy. And even after paying all such Taxes, there is no Job security, no social security and no benefits to the residents in the form of at least the health services even in this most polluted city. Do anything by paying under the table & get it regulated by paying over the table. Just this is the reason for all the mess in this city. The CRUX of the problem is, that none is serious enough to take care of OUR CITY. The unlivable city that is the Capital of India ! There is no doubt that Delhi has become unlivable due to excessive pollution, traffic jams & congestion. The RWAs just want that situation betters & not worsens. Traders too need some respite from sealing at this most crucial period, though they are responsible for all the encroachments in almost every market that causes jams leading to pollution. "It's our city & all of us must act sensibly & come forward to give a life to this unlivable segment of land else the coming generations will never pardon us". NEW DELHI: Terming the affidavits filed by the Delhi Development Authority as ‘weak for planned development in the city’, Residents Welfare Associations (RWAs) have urged the monitoring committee to study them properly and raise their concerns in the Supreme Court. In a joint statement released by a group of RWAs running the ‘save our city’ campaign, residents raised doubts over the scientific analysis and study being conducted by the authority over the impact of the amendments on quality of life and environment. “In its justification, DDA said it has gone for the vertical growth in tandem with international practices. But vertical growth depends on various geographical factors such as the seismic zone of a city, its proximity to sea for free flow of air and availability of water,” said Rajiv Kakria, member of Greater Kailash I RWA. “Besides, arrangements for sewer disposal, power supply and parking to cater to the increasing commercial growth also need due attention. I don’t think these factors have been considered at all,” he said. On Monday, DDA had filed an affidavit in the Supreme Court regarding the proposed amendments to the Delhi Master Plan -2021 in order to provide relief to traders from the sealing drive. “The DDA in its affidavit said its Act does not mandate environment impact assessment for modifying the master plan. This kind of response is unacceptable from any land owing agency. It doesn’t instil the confidence that DDA is capable of doing its job,” said Anil Sood, president of Chetna, an NGO. 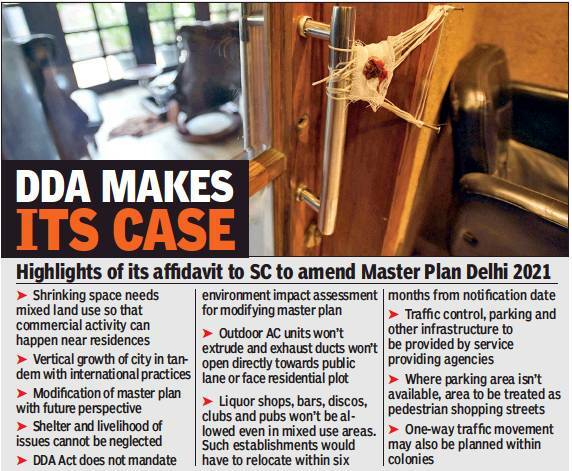 The RWAs said the DDA should modify its Act and only after that they should go for any change in the master plan. “The authority (DDA) must remember that Delhi has become the most polluted city and everything to be done in this city must be regulated by the environmental norms,” said BS Vohra, president, a federation of East Delhi RWAs. If DDA act does not mandate environment impact assessment for notifying the master plan, it's the DDA act that must be modified at the first instance & only after that they should go for any change in the Master Plan of Delhi. DDA must remember that Delhi has become the most polluted city & everything to be done in this city must be regulated by the Environmental norms. - There are ample Land Parcels and Vacant Shops in DDA Commercial Centers. All planned colonies have LSC/CSC/CC for daily needs and recreation. PRESENTLY THERE IS NO INCENTIVE BUSINESSES OR PROFESSIONAL FIRMS TO MOVE TO COMMERCIAL AREAS. People prefer to open Commercial Establishments & Law Firms etc in Residential Areas as presently the cost of such Acquisition is 75% lower compared to LSC/CSC/CC. The Conversion Charges (Rs. 6,136/-per sqm) and Cost of Land are much lower, even Provision of Parking Space is the responsibility of the Authorities, then where is the incentive to operate from a Commercial area (Rs.22,000/-sqm). NOTIFIED COMMERCIAL ZONES ARE LANGUISHING AND DESERTED DUE TO THIS OVERSIGHT IN THE MASTER PLAN. - Timings of Commercial Areas are in conflict with Residential Tranquility. Restriction of Closing Time as in the case of RULES OF ALLOTMENT OF CHAMBERS IN HC/SC from 9:00 AM to 7:00 PM should be enforced on Professionals operating in Residential Areas. - International Practices are devised keeping Geographical Parameters like Seismic Zones, Air Displacement due to Proximity to Sea (remember SMOG), Monsoon Patterns, Proximity to a River for Availability of Water, Green Buffer Zones to curb Soil Erosion etc. In addition Solid Waste Management, Sewage Disposal, Power Supply, Parking, Road Network’s Carrying Capacity, Availability of Schools/Colleges/Hospitals etc. must be ensured. DETERMINATION OF DWELLING DENSITY/CARRYING CAPACITY FORMS THE GUIDING PRINCIPLE OF MASTER PLAN PROVISIONS. - Master Plan is devised for Future Needs of its inhabitants to begin with, HEALTH and QUALITY OF LIFE is the prerequisite around which facilities are provided. Agreed one Shoe Fits All Approach is flawed, therefore ZONAL PLANS were to be made after Scientific Surveys, these Zonal Plans are still on the Drawing Boards after a Decade of MPD-2021 came into being. - Shelter in a Safe, Peaceful & Tranquil environment should be the basis for residential planning. Social Fabric is disturbed when inhabitants have contrasting requirements, be that Time of Operation, Usage of Common Spaces, Security Apparatus or Infrastructure Requirements. World over people go to the hustle bustle of Malls, Offices, Industries for Livelihood and return to their Peaceful Shelter. - ENVIRONMENT for DDA’s information comprises of AIR, WATER & SUNLIGHT. The making of the First Master Plan was ENTRUSTED TO THE MINISTRY OF HEALTH AND FAMILY PLANNING (now WELFARE). The Building Bye-Laws were devised keeping the abutting Road Width in mind, so that the Shadow of a Building in Front does not fall on the Building Opposite to it so that the inhabitants get ample SUNLIGHT for Healthy Living. The Height of a Building and number of Dwelling Units allowed were in keeping the AIR DISPLACEMENT PARAMETERS in mind to contain the Spread of Air Borne Communicable Diseases. IT WILL BE INTERESTING TO NOTE SUPREME COURTS RESPONSE TO THIS POINT ………. DO WE NEED SUCH EMBARRASSMENT ??? - Nothing New, Building By-Laws do not permit any projections outside the PLOTLINE. But who is overseeing this Blatant Violation ??? - The existing Provisions of MPD-2021 do not allow Liquor shops and pubs in Mixed Land Use areas and LSC’s in within Residential Areas. Multiple clearances are needed from multiple agencies, why were these agencies ignorant of MPD Provisions while giving Licenses ??? - Conversion Charges were collected, albeit unscientifically and were placed in ESCROW Accounts to be used for Infrastructure Development of specific areas. There is no disclosure of Amount collected nor has any Infrastructure been augmented since 2006. Only 8 Parking Lots have been made across Delhi which are lying disused. - Various Agencies entrusted to implement the Law have failed to prevent blatant violations even on Wide Master Plan Roads, how can they ensure Pedestrian discipline in interiors, while they have miserably failed to clear Foot Paths and On Street Parking despite Supreme Court Orders. - One way Traffic movement, wherever implemented has only created one more Parking Lane for the Parking Lot Operator to Profit and has done little to ease traffic movement in the absence of Traffic Police. Further, we welcome Supreme Court questioning the reduction of Conversion Charges. We have maintained that there should be MISUSER PAYS POLICY ….. NOT THE TAXPAYER. What Scientific Methodology has been used for calculation of Conversion Charges for the provision of additional Infrastructure necessitated due to extra FAR, so that the burden of the cost of such infrastructure does not fall on 1.50 Crore Citizens of Delhi by way of additional Taxes? Development Norms in the Master Plan once finalized after careful analysis and study of the Impact on Quality of Life and Environment should be sacrosanct and not be tinkered with, at least for the duration for which it has been framed. Thereafter also Master Plan must ensure that areas that have been declared Residential must remain so, to provide a Secure, Peaceful and Healthy Habitat for citizens. Talking Point with B S Vohra; Why RWA forums are against Delhi Governments parking policy? New Delhi: Even as the ongoing sealing drive in Delhi has sent shivers down the spine of the trading community, which stands at 7 lakh traders, leaving them wary about being sealed by the Supreme Court appointed monitoring committee, both residents welfare associations (RWAs) and traders are pinning their hopes on the all-party meeting called by chief minister Arvind Kejriwal tomorrow to arrive at a concrete and legally binding solution. While it’s still not certain if the Congress and the BJP would be participating in the meeting, called at the CM’s residence, the traders are hoping that even if the political parties do not come together on a common platform due to political considerations, they should at least play their individual roles to remove the sword of sealing which has been hanging over their heads ever since the Committee resumed the exercise in December 2017. After a brief stoppage in the drive in February, the sealing resumed after the Supreme Court earlier this month restrained the Centre, Delhi government and the Delhi Development Authority (DDA) from amending the Master Plan for Delhi 2021 to provide relief to the traders. In its order of March 7, the apex court had also pulled up the Delhi government, civic bodies and the DDA for not replying to the queries put up by it in the matter. With sealing resuming in several parts of the city, traders have been a rattled lot as their establishments were forced shut, impacting their livelihood. Kejriwal had also shot off letters to Prime Minister Narendra Modi and the Lieutenant Governor urging their immediate intervention in the matter. In the meantime, Delhi Congress president Ajay Maken also sought a meeting from Kejriwal on the issue, responding to which the chief minister sent invitations for a meeting on February 13 to Maken and Delhi BJP chief Manoj Tiwari. All parties have been urged to limit their participation to three members each to prevent chaos. This assumes significance as another meeting called at Delhi Secretariat a month ago between BJP and Aam Aadmi Party leaders had ended up in a commotion following which even an FIR was registered. 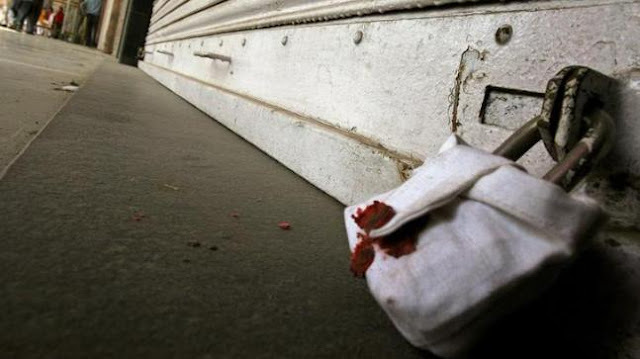 With a large number of units having already been sealed, the Confederation of All India Traders (CAIT) has called for a city-wide strike on February 13. Its secretary general Praveen Khandelwal told The Wire that “about 6 lakh traders of Delhi could be impacted by the sealing drive while only about 1 lakh may not be impacted at all”. Khandelwal said the process of drafting the Master Plan for Delhi 2021-41 has also started and so if the sealing is halted for the time being, through the new plan it can be ensured that the mistakes of the past are not repeated. He also accused the municipal corporations and the monitoring committee of acting way beyond their powers. “The MCD should only carry out sealing through the due process of law as has been specified in the MCD Act. But it is not doing so. The court-appointed monitoring committee is also violating the law. The MCD Act states that before carrying out any raid, the municipal commissioner will file a complaint with the municipal magistrate, a notice would then be sent to those accused of any violation, they will respond to it and following a hearing the matter would first go to the appellate tribunal and then the Lieutenant Governor. Only if the appeal is rejected from there too will the sealing be carried out. The monitoring committee has not followed these statutory provisions so the sealing is illegal,” he charged. On the issue of the RWAs claiming that commercialisation adds to pollution or burdens the infrastructure, he said this was not a correct argument as shops are largely non-polluting and operate for limited hours. Likewise, water and electricity supply are not impacted much during daytime when the shops operate. As for parking, Khandelwal squarely blamed the residents for keeping more cars than they should. “It is their cars which keep the colonies clogged all day through, why blame us,” he countered. The CAIT, he said, has given a bandh call for March 13 to press for its demands. As for the all-party meeting the same day, he said whether it is held or not the Delhi government and the Centre should pass the bills to ameliorate the sufferings of the traders. The RWAs for their part want solid assurances now from the governments that unbridled liberalised commercialisation would not be allowed in the residential areas of Delhi any more. He charged that politicians and traders are trying various tricks to derails the people’s campaign for clean living. “Many fictitious RWAs have been approaching the monitoring committee to stop sealing.” Also, he said that in many areas the RWA office bearers were being forced to toe political lines. But despite these hindrances, he said, the fight is on and that the RWAs has sought guidance from the monitoring committee on how they can implead in the Supreme Court in the ongoing case on the challenge to the ‘NCT of Delhi Laws (Special Provisions) Bill, 2007’ and the subsequent extensions to it. The RWAs, he said, have also brought it to the notice of the monitoring committee that most of the commercial establishments had opened in residential areas because setting them up cost about 75% less than it would have in a local shopping centre or a commercial complex. It is because of this that there were few takers for notified commercial zones, he said. The RWAs had also brought it to the notice of the monitoring committee that in the name of professional firms of lawyers, chartered accountants, architects and doctors, large commercial establishment employing large number of staff have opened up in residential areas and this has impacted parking in many colonies. Also, it was pointed out that “surrogate businesses” have sprung up in the name of professional services. So now ice-cream parlours masquerade as dairies, boutiques as tailors, gift shops as stationary shops and the like. Pankaj Agarwal of Delhi RWAs Joint Front said in light of this situation, the demand of the RWAs is that “for whatever commercialisation you are doing in a residential area, please get the impact assessment done for that”. He said about 12 years ago, when the sealing issue had first cropped up and mixed land use was allowed, it was assured that parking and matching infrastructure would be created in colonies which fell on the 2,100 roads on which mixed land use was permitted. Some norms were also created to overcome the problems. Pedestrian Streets & the One time parking charges? The Press Release of MoUD dated 26th February 2018 says that Traders have to pay one time Parking Charges. The parking will be provided as per the provision of MPD 2021. In case the parking cannot be provided within the plot, the concerned local bodies shall identify and develop the land for providing shared / common parking. In the absence of any land for the parking in the vicinity, such complexes / street shall be declared as “Pedestrian shopping street / areas”. My question is that are they charging one time Parking charges for such areas, that were earlier included in the Delhi Gazettee as the Pedestrian streets? The reason for asking this question is that when Govt can not provide any land for the parking in the vicinity, and such areas are declared as Pedestrian ones, how they can ask the traders on such roads to pay the one-time parking charges? How can Govt charge the Traders for something, that is not at all available? Please check the 10 blog posts below this blog post, that contain the list of the Pedestrial streets, Notified in the Delhi Gazettee dated 15th September, 2006. Labels: Pedestrian Streets & the One time parking charges? Mohalla (Bada Bazar) 3.50 Avg. 40 Link Road Bada Bazar IX/701 to IX/479 5.50 Avg. Multani Mohalla Road 5.00 Avg. 48 Link Road Bagichi Nand Kishore Gali IX/1328 to IX/1410 5.00 Avg. Link Road Nehru Gali 3.50 Avg. 118 Road Along DDA Park Karkardumma Road 212 to 253 5.50 Avg. Chhota Bazar Road 5.00 Avg.